How Engaged Are Your Staffers? First of all, what is employee engagement? Second of all, why should we care? And lastly, if we decide we care, then what? These are good questions that every caterer with employees should be able to answer. So let’s start with the first one…. Our friends at Wikipedia say: An “engaged employee” is defined as one who is fully absorbed by and enthusiastic about their work and so takes positive action to further their organization’s reputation and interests. 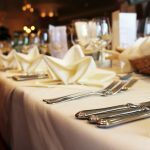 Why should we as caterers care about employee engagement? A catering firm with high employee engagement will deliver better products and services than one with lower employee engagement. Engaged employees create better guest experiences, lower costs and they attract other winners to join the team. This results in increased revenues, decreased expenses and a strong bottom line. What can we do to improve employee engagement? I would recommend my company as a great place to work. I rarely think about looking for a job at another company. I see myself working at my company in two years’ time. My company is in a position to really succeed over the next three years. I have confidence in my leaders. My manager genuinely cares about my wellbeing. Other departments collaborate with us well to get the job done. I have access to the things I need to do my job well. So what’s next after you receive the survey results? The survey is the easy part. You can go to www.cultureamp.com and see the questions first hand. The hard part is identifying areas of concern, coming up with alternatives that will improve the situation, implementing the necessary changes and following up to insure that improvements are being made. And if not, why not? That’s why we are called leaders and managers. We must lead and manage our teams. Copyright © 2017 Certified Catering Consultants. All Rights Reserved.